25th of June 2013 A.B. "Upheaval of the soul" is now available in both LP and CD. Copies can be purchased through O.C.S.R & T.O.R websites or directly through the band. To coincide with the vinyl version, a new Tshirt design has been released by O.C.S.R. Morbid Tunes of the Black Angels IX compilation is at thepressing plant right now. Discography and merchandising sections have been updated. 1st of May 2013 A.B. 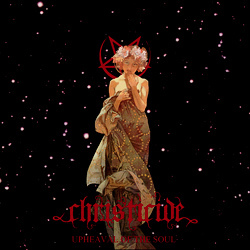 After much delays, the sophomore album of Christicide "Upheaval of the soul" will be released on the 20th of May 2013 A.B. A pre-order of the CD is already possible from the Those opposed records website. As planned, LP will be released shortly by Of Crawling Shadows Records. In connection with the album release, 2 new tshirts will be available soon. The first one will represent the album cover and will be released by Those opposed records and can be pre-ordered too. The second one has been released by Dead Seed Productions and represents the song "I was able to guess". Design here. We are also proud to announce you that we are participating again on the Morbid Tunes of the Black Angels compilation tape. unreleased cover of Dodheimsgard masterpiece "Mournful, yet and forever" which was recorded during the "Upheaval of the soul" session. That part will come as a pro tape. All Hails to Lord puke for endless support since our early days ! 5th of September 2012 A.B. Christicide live in Clermont-Ferrand with Doom Metal band Huata on Friday 21st of September 2012 A.B. Third band to be announced shortly. 24th of June 2012 A.B. some artworks for the booklet. Artworks that surely deserve the waiting. On an other topic the "Apex of negativity" demo tape is almost sold out from us. We have approximately 15 copies left here that can be obtained for 4 € each + postage. 8th of May 2012 A.B. Our humble and Morbid thanks to all the Russian lunatics who showed up on Saturday. You simply are the best crowd we have ever had so far ! ATH / Blackwinged, Ridge ov Dragon and all those who made it possible. 23rd of January 2012 A.B. It's now official, Christicide will play in Moscow / Russia on the 5th of may 2012 A.B. The gig will take place at Rock house with Aosoth (Fr) as Headliner and Evilwinged (Ru) as opener. We’re all looking forward to spread with fury the Dark Red Evil over a crazy Russian crowd. 3rd of January 2012 A.B. Christicide sophomore album "Upheaval of the soul" is now recorded. The album consists of 6 songs for a total length of approximately 45 minutes. The song Demon's breath can now be listened on the player right above. The vinyl version, as usual, will be released on Of Crawling Shadows Records. who will carry the distribution in America. A tape version will follow later, on Hospital production. There is no release date yet. More informations will be posted on this website when needed. T-shirts and Long sleeves of the album to be released by Those Opposed Records. An other tshirt design is also planned, released by O.C.S.R and the band itself. Christicide is now available for gigs/tours and interviews as well. Another gig is confirmed, on the 3rd of march 2012 A.B. in St Sulpice, south of France, with Ritualization, Ossuaire and Seth. 20th of October 2011 A.B. gig focused on new songs, and the response was great. where we'll play again with the unholy flame bearers Temple of baal & the Dark Death metalers of Ritualization. Flyer soon available in the live section. Saturday 15th of October 2011 A.B. 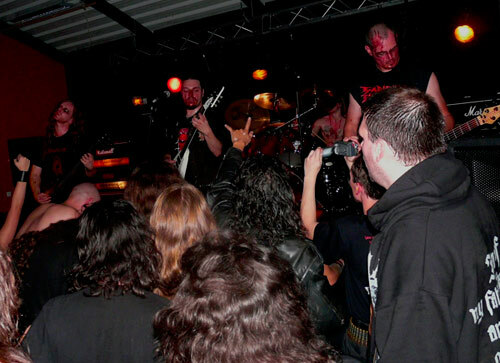 Saturn's wrath tour is over, Christicide would like to thank all the fans and morbid maniacs who showed up. therefore no live performances will occur until then except if something really special can be settled. A few tour t-shirts are still available in size L only, and some girlies as well (S,M and L). Design can be seen in the merchandising section. Tour poster will be included with each order. The re-release of the 1st album on Those opposed records is finally available directly through us or the label. Also, a live tape has just been released on Dead seed productions and is available through both label and band. Pro tapes, crimson death cover and limited to 250 copies. Christicide will tour through Europe in November with French messengers Malhkebre. Each date will change headliner. Servants of darkness are conveyed to come to the sabbaths in order to celebrate Red Evil ! Both bands will have exclusive t-shirts for the tour.